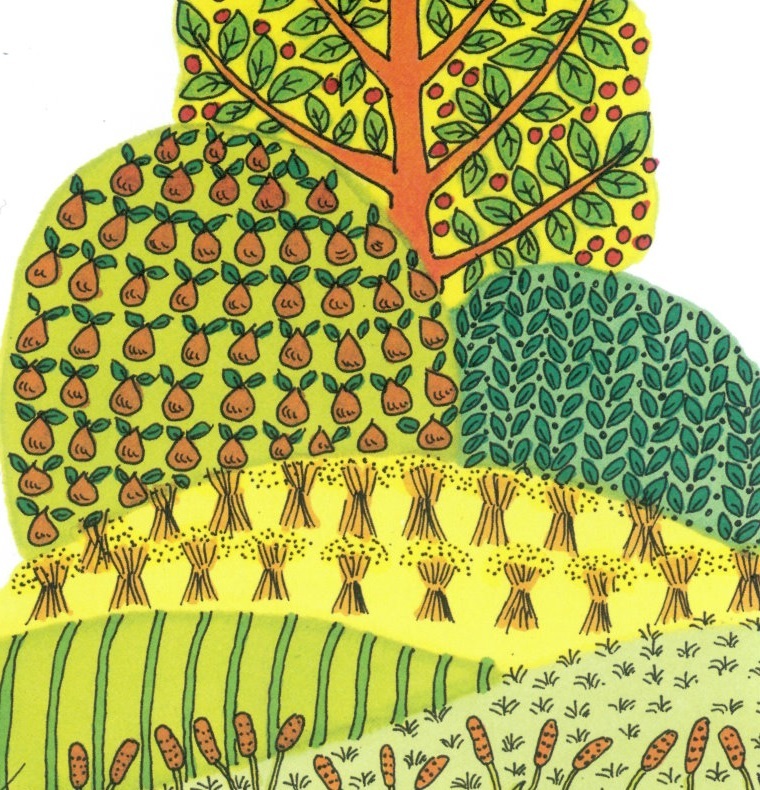 There’ve been a spate of belated children’s book sequels lately – Alan Garner’s been back to Brisingamen and Judith Kerr’s followed up The Tiger Who Came to Tea. Now Pat Hutchins has brought out the sequel to one of my very favourite picture books, her perfect debut story Rosie’s Walk. But Where, oh Where, is Rosie’s Chick? differs from those titles in the way it remains faithful – exactingly so – to the style of the original book. It’s a fascinating exercise in returning to your past – using long retired methods and taking on the restrictions that come with them. Few artists like the idea of revisiting past glories in the fear that they might ruin the original. I asked Pat Hutchins whether she had any reservations about doing this sequel. 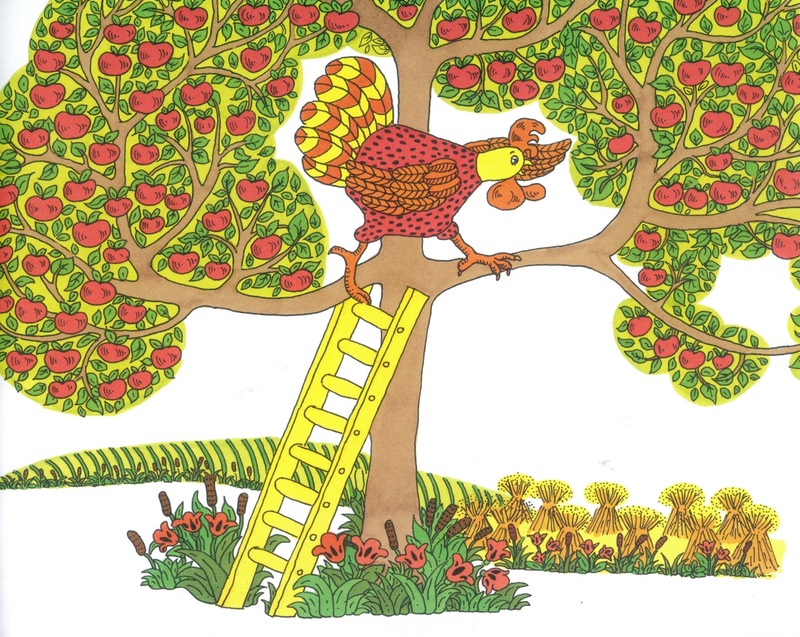 It’s been 47 years since Rosie’s Walk (the Times called you the Harper Lee of children’s books). Why have you decided now to return to Rosie? My editor and I were thinking of doing a counting book, possibly with chicks, and the moment she mentioned chicks I thought it would be lovely for Rosie to have a chick of her very own. It made sense and was a way for Rosie to have another walk without repeating the story. 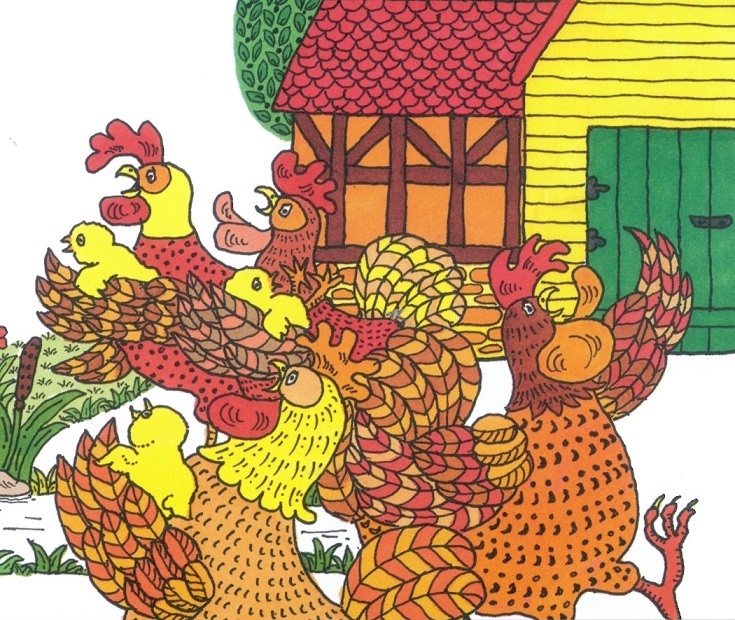 Were you trepedatious about revisiting a book that is beloved by so many people? I’m a little nervous as Rosie was so popular, with children and teachers alike! Hopefully with the introduction of Rosie’s little chick, the story will take on a new lease of life. How difficult was it to pick up the style from the beginning of your career? I wanted Rosie to be instantly recognizable as the same one in Rosie’s Walk, so I deliberately used the same flat colours and black outline in the drawings for Where oh where is Rosie’s chick, it seemed quite natural to work in the same style. When I did the book originally we were very limited in terms of the colours we could use – we only had red, yellow, green, and then black if you combined the colours! I thought about introducing blue this time around, but it just didn’t look right – which is why I kept to the same colours I used in Rosie’s walk. Do you work digitally now, or stick to the original methods? I still use magic markers, felt tips, to get the colour, and then I draw around them with black ink to get the bold outlines. You created the original story when you were living in America. Did writing the sequel bring back any memories of that time in your life in New York? I was looking through Rosie’s Walk before starting on the story of Where, oh where is Rosie’s Chick? And in it I had drawn a groundhog. It reminded me of the very first time I’d ever seen one in upstate New York. He’s the little character who could easily be mistaken for a beaver! Why do you think Rosie’s Walk has remained so popular after all these years? Rosie’s Walk as lasted for so long because even the smallest child can read it. Even if they’re not quite there with the letters yet, they’ll understand the book, and more importantly, they can remember it. I never expected it to be so successful so quickly though, I was just thrilled for being paid to write! Watch Pat Hutchins talking and drawing Rosie’s Walk from the BBC Four documentary series Picture Book. Where, oh Where, is Rosie’s Chick? is published by Hachette. Rosie’s Walk is published by Random House. Tags: Alan Garner, Harper Lee, Judith Kerr, Pat Hutchins, Rosie's Chick, Rosie's Walk. Bookmark the permalink. A really fascinating interview. 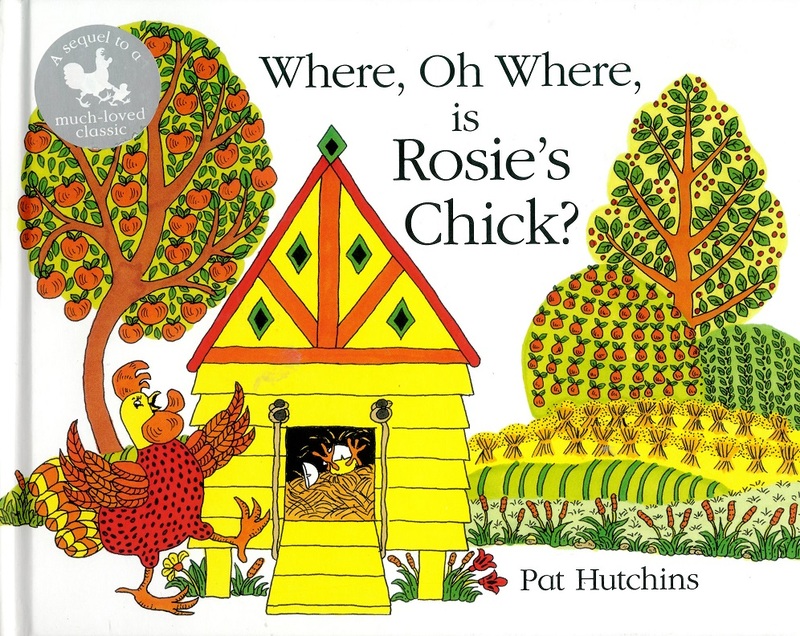 I can’t wait to read Where, oh Where, Is Rosie’s Chick? 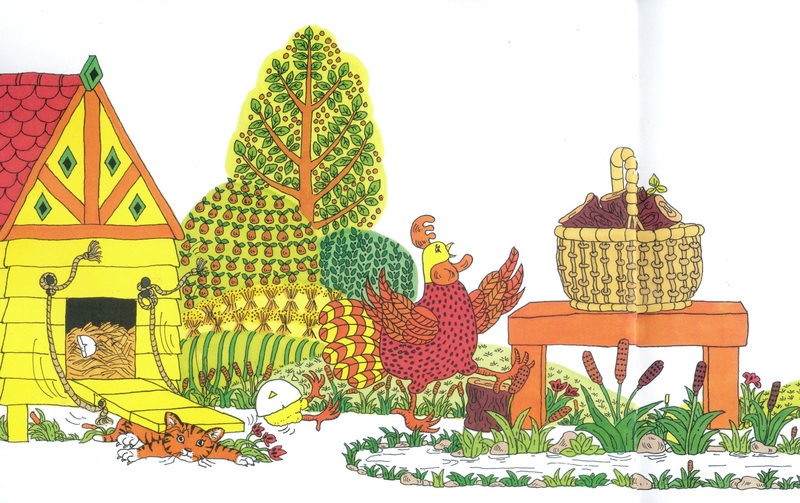 How lovely to read some of the backstory – and see those familiar-but-different illustrations. Excited to see the sequel to a book that has inspired so many authors – and been loved by young and old. Never too late for a sequel. What a brilliant interview! Can’t wait for the book!